Ultraman BUL Ground "Ultraman R/B", S.H.Figuarts by Bandai Hobby. 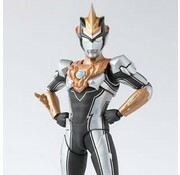 - Ultraman Rosso, Ultramanble can reproduce one scene in the play! - Ultraman Bull is transformed with [Victory Crystal] with [Sat] attribute. - The coloring of the head which imaged the characteristic bronze color is reproduced by imagining in the play. - The color scheme of the body based on the characteristic black of the bull is reproduced. Ultraman BUL Ground "Ultraman R/B"